The Royal Canadian Mint is world class producer of 1 oz gold bullion, silver and platinum coins and possibly also the leading innovator of all the mints. We welcome your comments and feedback which you can add at the bottom of the page. Since the Royal Canadian Mint was founded in January 1908, they have minted 100s of millions of coins for itself and other countries (currently at a rate of up to 15 million a day) and have achieved many firsts in the development of coin production. In 1979 the mint started producing the world famous Maple Leaf series. The Canadian Maple Leafs are minted in gold, silver, platinum & palladium and have been produced in a wide variety of fraction troy ounce sizes; 1, 1/2, 1/4, 1/10, 1/15, 1/20 and 1/25. Here we will be looking at the 1 oz gold bullion, silver and platinum Maple Leafs, as this is the only size that is currently available for trading on the Allocated Bullion Exchange, and specifically at their recently introduced anti-counterfeit security feature called Bullion DNA (Digital Non-destructive Activation) technology. 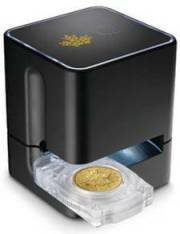 In 2013, the Royal Canadian Mint launched a unique anti-counterfeiting security feature that it first incorporated into the 1 ounce Canadian Maple Leaf gold coin. On both sides of the coin there are microscopically thin lines radiating from the centre of the coin. On the coin’s reverse is a small textured maple leaf to the right of the leaf’s stem. Inside the centre of this mark are the last two digits of the corresponding year of the coin’s issue. The Royal Canadian Mint then takes a high-resolution digital image of the coin that is then stored on their servers. It’s these digitised unique features that are that the mint call Bullion DNA. 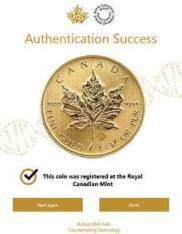 Authorised Bullion DNA dealers & distributors are now able to digitally verify the authenticity of each 1 oz gold bullion Maple Leaf coin that has been minted from 2013 onwards. They can check and verify each individual coin directly with the mint in a matter of seconds. This secure verification solution gives those that deal with Maple Leaf coins a level of confidence previously unavailable to the precious metals industry. Following the successful launch of the laser engraved security feature, it has been rolled out to the 1 ounce silver and 1 ounce platinum bullion Maple Leaf coins in 2014 and 2015 respectively. When you buy a 1 oz gold bullion Maple Leaf coin that was minted after 2012 and want it to be authenticated, you need to take your coin to an authorised Bullion DNA dealer or distributor (currently only available in North America). The Royal Canadian Mint has provided the following video to give you a quick overview about the coin’s unique security device in action. 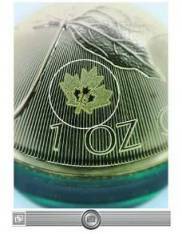 The first video shows the security device being used for a 1 oz gold bullion Maple Leaf coin, which also works for 1oz silver and platinum bullion Maple Leafs, and the second video gives an overview using the 1 ounce silver Maple Leaf. We have over 20 physical precious metals products available for you to trade on 9 bullion markets worldwide. To see what we have, go to our main products page.